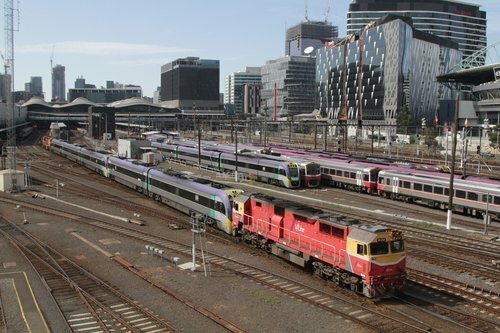 Since the middle of January 2016 V/Line has been having major issues with their fleet of VLocity trains, resulting in dozens of cancelled services and the crush loading of the trains that are running. Here is a selection of photos from the period. excessive wheel wear reducing the number of trains available for service. 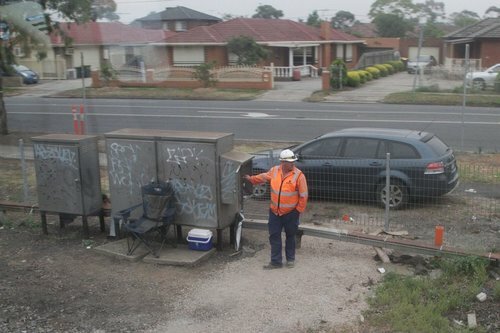 level crossing activation issues resulting in a ban from the suburban network. 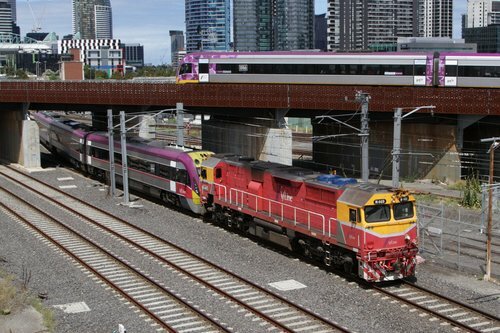 The first sign of trouble was the widespread replacement of V/Line services by road coaches, as VLocity trains with worn wheelsets were pulled from service. 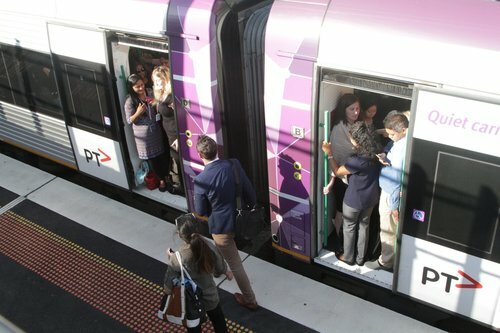 But things got worse on the evening of January 15, when V/Line blamed “unplanned metro works” for the cancellation of late night Bendigo and Gippsland line services – in reality it was a ban of VLocity trains from the suburban network. By the morning of January 16 V/Line’s excuse had changed to “service changes in the suburban area”. 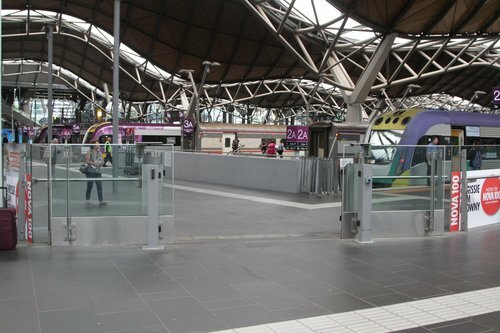 At Southern Cross Station passengers for Traralgon and Echuca services were told to catch a suburban train to meet their onward connection. 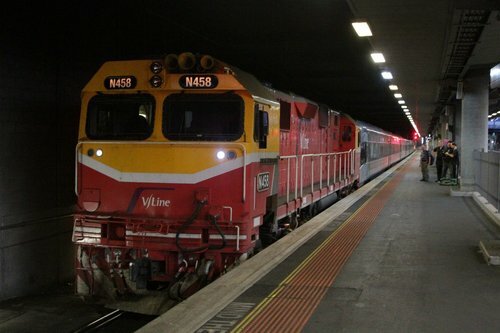 That night V/Line lashed together a VLocity train between a pair of diesel locomotives, ready to send them across the suburban network to test the failing level crossing outside Dandenong. 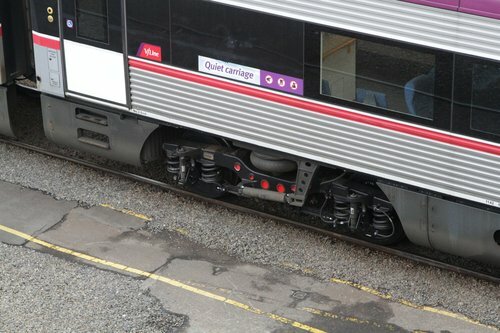 VLocity trains are fitted with a fully automatic Scharfenberg coupler, but diesel locomotives only have a semi-automatic knuckle coupler, so a special ‘transition coupler’ needs to be fitted to bridge the gap. To allow the tests to take place, Metro Trains obliged by cancelling all late night suburban services between Dandenong and Pakenham. Once the train arrived at the testing site the diesel locomotives were removed, and the VLocity train made a number of passes over the level crossing. In the days that followed, more special VLocity transfer trains operated across the suburban network – each movement requiring a diesel locomotive to be attached as a safeguard to activate level crossings along the way. 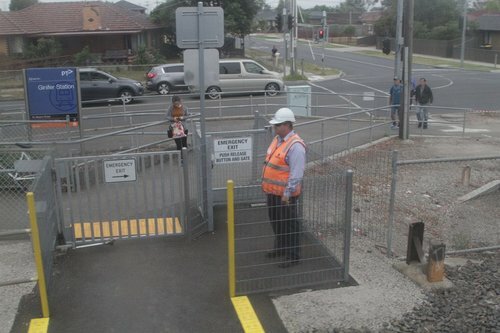 By January 18th VLocity trains returned to the Bendigo line – with only two troublesome level crossings on the line at Ginifer and St Albans, safeworking staff were posted at each crossing in order to manually activate the warning devices. Staff were also posted at the pedestrian crossing to be doubly sure. 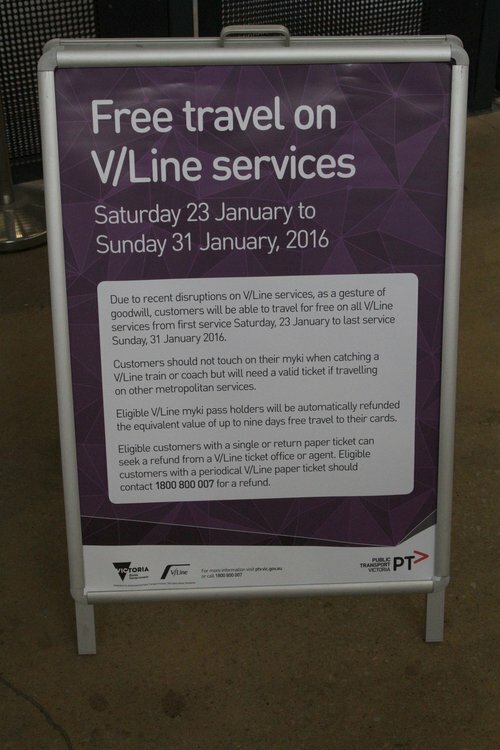 To compensate for the disruptions to services, in V/Line declared free travel on all services from January 23 to 31. 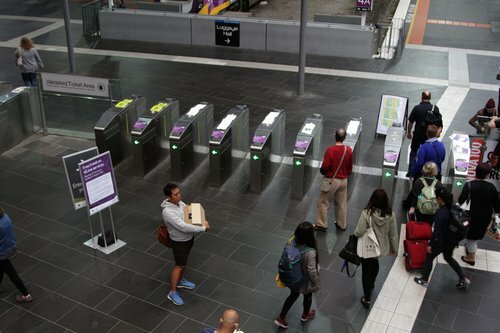 To avoid passengers mistaking touching on their myki cards and getting changed for their journey, station staff printed out their ‘Free travel – no need to touch on’ signs. At Southern Cross Station the ticket gates were locked open. As were the emergency entrance gates. 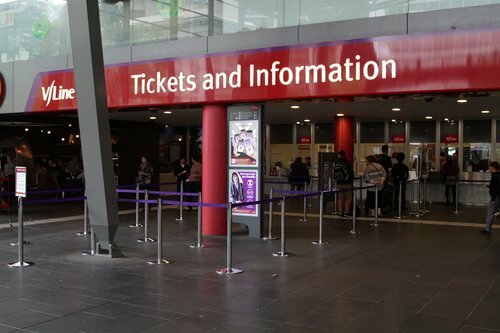 Yet for some reason, there was still a line of passengers at the Southern Cross Station ticket office. After the first week of free travel and no resolution in sight, it was extended another week until February 7. 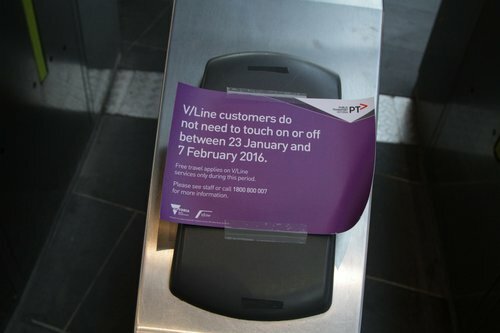 Official ‘no need to touch on or off’ flyers were printed and affixed to myki readers across the network. 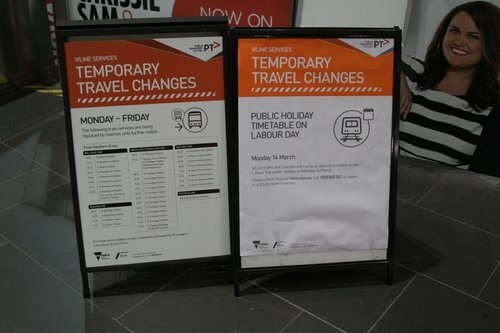 Permanent timetable boards were also printed for Southern Cross Station, listing the scheduled V/Line coach replacements in place Monday through Friday. Despite the coach replacements and free travel, V/Line commuters were still spilling out of overcrowded trains. As an interim fix, a 25 km/h speed restriction was applied to the North Melbourne flyover – supposed source of the excessive wheel wear. On the weekend of February 13 the flyover was shut down to rail traffic, as the ‘outside’ broad gauge rail through the curves was replaced. In the weeks that followed, trains continued to use the track, but with rail staff manually applying grease to the rail heads. And the worn wheels beneath VLocity carriages have been replaced with fresh sets. 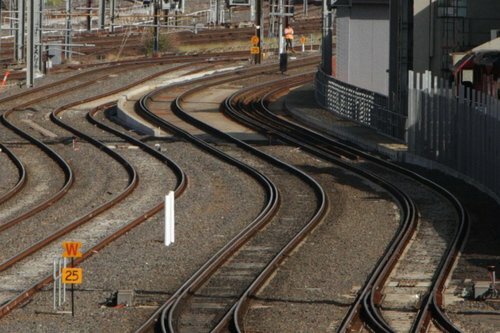 From March 21 normal rail services started to return – with 43 out of the 64 disrupted services back as trains. 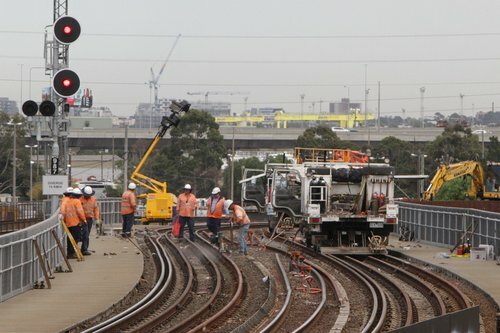 Yet to be completed are fixes for the root cause of each problem: axle counters at level crossings on the Dandenong line to ensure reliable train detection, and an automated rail lubricator on the North Melbourne flyover to reduce wheel wear. « Skyrail – now you can bet on it! 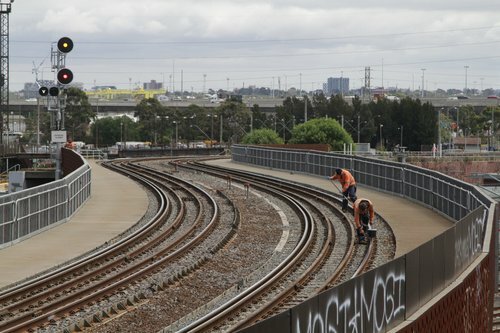 Change at Footscray for the City Loop? The free travel, rather than compensating, made the crush problem worse as more people decided to go on a train trip, further inconveniencing those who regularly travel. Similar to Telstra’s recent free data days. 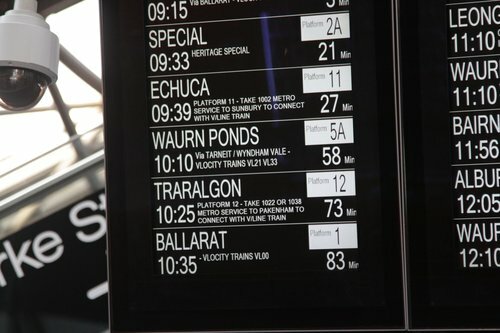 I took advantage of the free travel by taking a trip to Ararat – the return trip was crush loaded at Ballarat as a few dozen families on their way home all tried to pile aboard a single 3-car Vlocity set! So, the wheel wear issue was just on that flyover? How did that happen? Why is the flyover any different then any other piece of track? 1. the flyover has the some of the tightest curves on the network. I believe that wheel wear is proportional to the “tightness” of the curves. 3. almost every V/Line service to the north, south and west went over that flyover. Consequently this lead to significant wheel wear as we’ve seen. 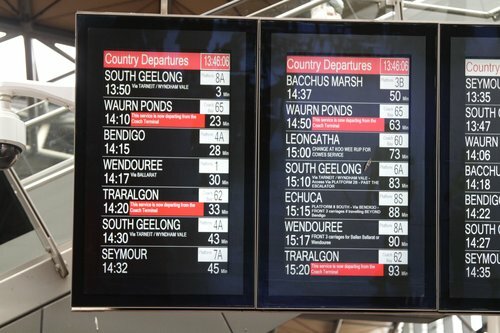 As well as having almost every V/Line serivce using the flyover, the new timetable introduced in June 2015 also increased fleet utilisation, with the new 20 minute service to Geelong and 30 minute service to Bacchus Marsh. More kilometres run = more wheel wear. Those who decide what information is given out on Twitter could be accused of being little more than PR people. 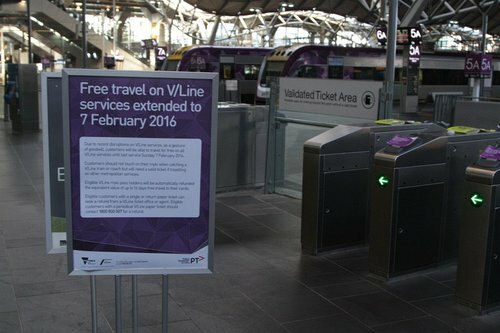 While I would not expect them to say, Vline had been banned, they ought not tell blatant lies. Reminds me of the time they called a broken down V/Line train an “obstruction on the tracks”. 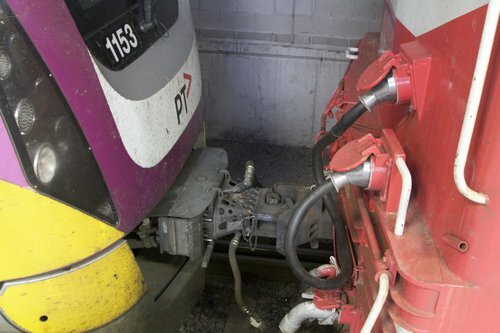 I was just wondering if Vline use track lubricators. If they don’t, this may be the cause of the wheel flange wear problems. There are plenty of ‘grease pots’ on the suburban network, but I’m struggling to think of any outside Melbourne. Maybe make sure there are some more of the old diesel engines since they seem to be able to keep working and not break down? Naaah! That’d be too smart! I think that this problem of the wheels being worn might have something to do with the extending services to Waurn Ponds. Waurn Ponds station is only five kilometres down the track from Marshall, so it can’t be a major contributing factor – not to mention that it opened back in 2014.